​This cardboard chair is sure to grab attention with it's Eco-friendly appearance and innovative design. For use at outdoor events - Music festivals, outdoor cinema's, concerts, food and wine events. Add your logo to the back panel or colour the entire chair for some positive, environmentally friendly feedback for your business. ​Made from 100% recyclable cardboard - Comes flat packed - Simple folding setup - Can hold over 200kg - Large flat panels are great for advertising and can be printed with 1, 2 or 3 colour logo's. Based on a similar design to the simple solution above, this chair has 2 completely waterproof cardboard containers under the seat area which hold 24 drinks plus ice! This chair has larger panels for advertising given its all round bigger design. 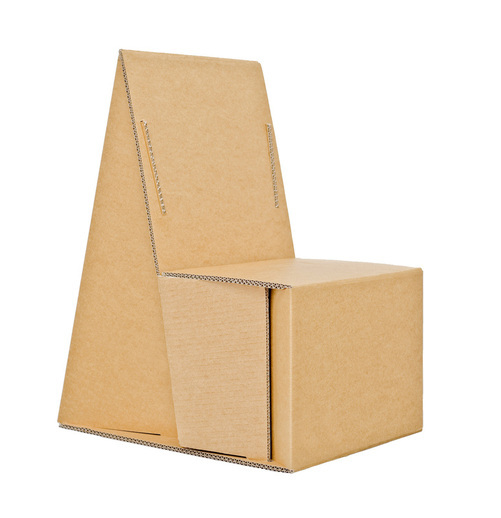 Made from recycled cardboard and can obviously be recycled again, this chair will gain a huge amount of attention for your company. Comes flat packed and is easy to assemble.